Throckmorton P. Gildersleeve raises his orphaned niece and nephew in the small town of Summerfield in this critically acclaimed radio comedy. Outside of the home, the soft-hearted yet blustery bachelor works as a Water Commissioner and romances the local ladies. This Fibber McGee & Molly spinoff stars Harold Peary and, later, Willard Waterman as Gildy. 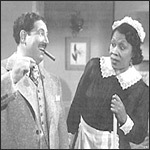 Walter Tetley, Lurene Tuttle, Lillian Randolph, Shirley Mitchell, Earl Ross, and Arthur Q. Bryan co-star in escapades that are both heartfelt and hilarious. Gildersleeve learns the hard way that the folly of family and friends are small potatoes compared with our own foibles! (4/7/1948) ADELINE GETS GILDY JEALOUS/WHO IS GILDY'S SECRETARY?